Our official address is on Aurora Ave North, Seattle WA 98109. However, Google Maps and Apple have not updated directions their to this address. 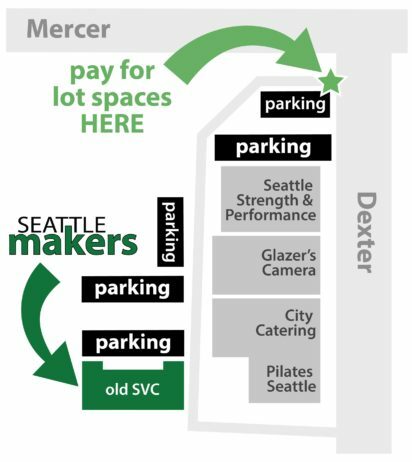 We are accessible via the south-west corner of Dexter and Mercer. To see how to get here, check out the Directions section below. The building at this address is Seattle Strength and Fitness (the green gym on the corner). Turn into the parking lot and drive to the back lot. We are in the 4-story building with SVC written on the side. We are on the second floor – when you arrive, ring the doorbell and someone will let you in. Pay at the meter next to the green gym at the corner of Mercer & Dexter. Check out lot locations on our handy-dandy parking map. Pay on your phone using the Pay By Phone app or via credit/debit/cash at the street meters. We are committed to recycling and making the most of every tools and material, which is why we are so grateful for donations to supplement our supplies. If you are getting rid of functional tools or equipment, materials including plywood, paint, fasteners, etc., please consider donating to Seattle Makers. If you would like to donate items, please contact us. To email us, use the form below. Or call us at 833-2-MAKE-IT.